Frank, thanks for the translation! The numbers refer to the style of the item, and sometimes to the item # in production, that is why sometimes they also have letters, and multiple numbers in 1 label. Without a catalogue to refer back to it is hard to say. The first is a uranium green vase 8Â½" (21.5cm) tall. Strictly speaking I don't think this is Murano, but 'Venetian'. 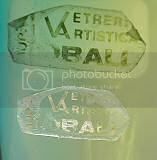 The label (badly ripped) merely states 'Venetian Art [Glass?]' and is situated on the neck. It also has one of the small circular 'Made in Italy' labels on the base. The central portion of this label has a tiny logo that looks like a 'G' with an 'H' in the centre, so either 'G.H' or 'H.G' is the maker? The second is a clear plastic label, with gold lettering. 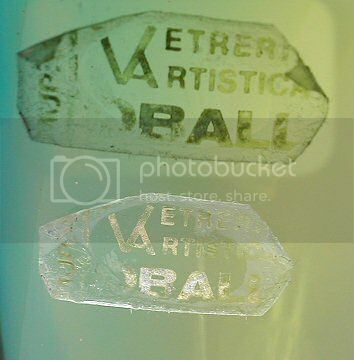 On the left side is written vertically 'Murano', with 'Vetreria Artistica' and 'OBALL' to the right. Any clues to the maker? The label is shown twice, as the backlit version shows the lettering clearer. Thanks for the info - I didn't have time to scrutinise the earlier postings so am pleased to learn it's a "known" maker. I actually only paid about Â£5 for it (~ $10) although it does have a small chip on the rim. Good news is I managed to find another on eBay. A massive, heavy beastie at 7Â½" (19cm) with pulegoso effect to create the excellent feathered effect. I have several other examples of V.Nason that I can post. As mentioned in the 'Fazzoletto' thread, here is the label. Please click thumbnail to enlarge. 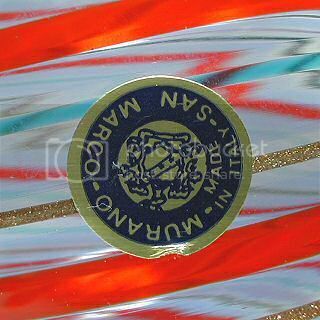 Around the edge it mentions; 'SAN MARCO : MURANO : Made in Italy. Does anyone know the maker? 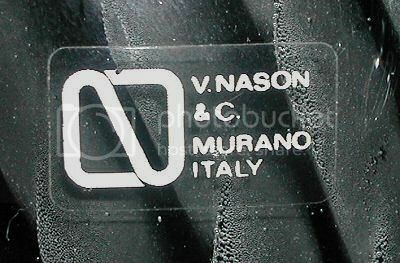 ... Around the edge it mentions; 'SAN MARCO : MURANO : Made in Italy. Does anyone know the maker? I dont know, havent seen the label before either. Looks like a current manufacturers label. I do have another piece with a label but the label is so badly worn that it would not photograph well. Its on a sculptural modernist sommerso basket very similar in color and style to a piece shown on the left of page 223 of Pina's Italian Glass, marked as Frattelli Toso. David, I have a peacock vase made by the Swedish glass company Elme, which has a label with G.H as described by you. I have always believed this to be the U.K. Importer's label, i.e. George Hardy. (check out my label to see if its the same as yours). I have had other pieces in the past with the same GH logo on, and these have included pieces by Aseda Glasbruk. 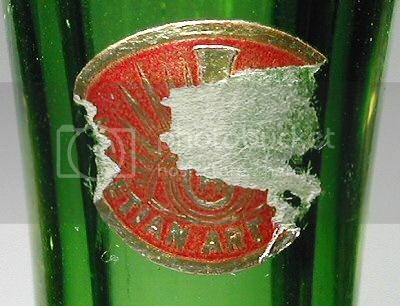 I have also seen the same label on Raymor glass too. David, I have a peacock vase made by the Swedish glass company Elme, which has a label with G.H as described by you. Thanks, this is starting to get clearer. The label is identical apart from the wording. Javier reckoned it was a Cenedese vase, so I assume Hardy imported a variety of glass and just used appropriate labels! Hi David. 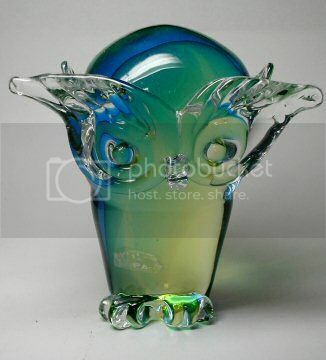 Just checked "Glass Notes" on Great Glass website which states that G.H. 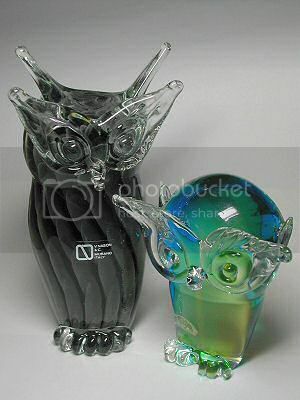 were active in 1950s, importing Scandinavian and Murano glassware.